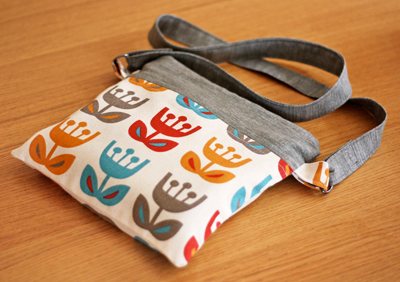 I made a little cross-body zippered pouch with a scrap of my Tulip print from Outside Oslo. It's about 9" square. I mimicked the format of a sweet little bag sent to me by Nathalie awhile back (thank you, thank you! )—the size and shape are nice for carrying a wallet and just a couple other goodies while out running around. Update: The travel bag is awesome. I love it! It's so adorable, and it looks rather uncomplicated. You are so very talented in your dabbling...cheers! Oh that is really cute and you made it!!! I wish I could make bags. It would save me so much money and I could have alot cuter ones than in the stores! that's so cute. I love your new fabric! i think it is just adorable!!! good job! Very sweet! I love that fabric. it is so cute! i'm the same, i wont ever be great at sewing, but love that i can make easy projects on my own. where did you get that fabric? Lovely. Less is more. Amazing how simple rectangles can come together in such a useful way. or perhaps the better question is how did you make the fabric? Three Birds, I designed this fabric; it's one of the prints from my new Outside Oslo line distributed by The Needle Shop. You can buy it online right here, or it will begin appearing in fabric stores soon. Oh, I am loving this purse. The fabric is just devine. Is it an existing pattern? I love sewing practical items, this is the perfect size. Oops, I typed my reply while you clarified your question. I designed the prints in Illustrator; then we sent the files to a fabric printer who had them made into screens and manufactured. Happy in Red, I didn't use a pattern. I think you can find any tutorial online for a zipper pouch and then modify it a little bit. I used the zipper pouch instructions in the book "Sew What: Bags" and changed it to add an extra band of fabric at the top and two little tabs at the sides. Next time I'd put those tabs higher up, though. The top tends to sag a little. Umm, you are going to make more and sell them, right? Because I would totally buy that! Oh, wait, the point is to make it yourself, yeah I can't do that! Such an adorable little bag! And your fabric is just awesome!! So I really have to make that travel bag now, huh? I WAS going to back out, y'know. Ha! Can't wait to get at it! It's darling! Your new fabric is fab! I would never have guessed you only dabbled in sewing from seeing that bag. It's so adorable and looks very well-made! Good job! What pattern did you pick for your travel bag, or are you making your own? I'm trying to decide on one to (try to) sew. would LOVE to see a pattern for this! i'm trying to teach myself to sew as well & this appeals to me. btw - i like that you said you're tempted to give up because it's not going as fast as you'd like. my exact issue! gosh i love that fabric! Super duper cute. Good job! I really loved your post title. wow great job! i'm actually kind of afraid of my sewing machine...and am tempted to sew things by hand instead. That is so cute. Yay for you. It's great seeing your fabrics in use and what a supercute bag...I too have been getting in touch with my inner sewer lately and I'm loving it. My mum is a right-handed career machinist and I'm a left-handed make it up as I go along sewer...so I've always had a love hate relationship with a sewing machine as it seemed to always cause tension between us overe the years, now I am sewing what I like how I like and mum is just helping when I ask...I think she's been a little surprised! Super cute. And your fabric is lovely up against the solid color. i'd buy one in a minute! love the fabric combination. Jess - you did a super job. It's a cute baglet. Great fabric and for a "dabbler" it looks pretty good! The bag looks lovely, the print actually makes all the difference. The bag looks so cute - you'll never use a big bag again! Is your fabric available in the UK? I don't know if any shops over there have picked it up yet, but The Needle Shop will do international shipping. It's $13.25 for a flat rate priority envelope that holds up to 4 yards. You can shop for fabric right here. that is such a great bag! I may have to make something similar for myself. What an adorable bag. Love the gray with that print! I love your fabric! so cute and great colors! I'm "sew" excited about your fabric. Some is on its way to me right now and should arrive in the next day or two. Yippee! Oh, it seems that pattern is already out of stock, as I can't find it at the NeedleShop. Do you think it will be available soon? By the way, your blog is amazing! Mlle Miracle, check again; there should be lots and maybe they just needed to relist it. I see some in the shop now. Check here. Hi any chance you can share the pattern? I didn't use one, sorry! It's basically a zipper pouch, just with a taller body. Google "zipper pouch tutorial" and you'll see lots of how-to's, I think. Oh, I was just in love. The bag is so beautiful and exactly what I'm looking for. Is there a tutorial and where can I find it? Thanks a lot for your help. I didn't use or make a tutorial, but you can adapt any basic zipper pouch tutorial to make this. Just sew an extra band of contrasting fabric on each panel. And add loops with a D ring in them to the side seams before you stitch it up. Many thanks for the quick answer. I'll try it, as you described it.